Makes that Bullingdon picture look like a teddy bears picnic, doesn't it? Is it really him? - he's gained a bit of weight. Bizarrely, although I am usually happy to weigh into any Balls-bashing, on this occasion I can't help but think that I wouldn't like to be judged by all that I said and did in 1986. (Although you'd have found me on the CND\Greenham\poll tax march end of things in the 80s rather than the Nazi sympathizer parties). Not really, Ed is a silly student in fancy dress, people's concerns about the Bullingdon Club aren't to do with the uniform as such. So one is a Thatcherite Tory dressed as a Nazi and the other is a Thatcherite Tory dressed as a toff, big difference, I do apologise. You still aren't grasping it, the issue with Bullingdon Club isn't they are "dressed as toffs". Absolutely right - one fancy dress party, which is all the evidence the photo provides, is a fair leap from the social and economic assumptions of Bullingdon affiliation. Big deal. German / nazi soldier was a standard kid's fancy dress costume. There was something deeply, deeply disturbed about that last bunch. Yes. If we are going to give the thumbs down to Ed. B. let's FGS make sure it is a real reason, not some trumped-up piece of nonsense. It is a Wehrmacht uniform. Regular German army. If it was a Nazi uniform, it would either have 'SS' lapels or a rank on the right arm (had its own rank structure), or have a nazis arm band, indicating a member of the Nazis party. Officers also had a skull on the cap below the eagle. Fffs, why do journalists not do any research? And why do you believe everything you read? GOOGLE IMAGES it. 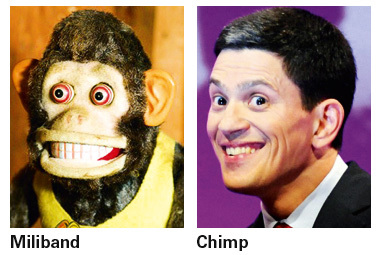 Millipede, Brown, Prescott, Balls and co seem to have some strange physical affinity with the simian world. Conjoined at birth and successfully separated. You are right, strictly. Although "fancy dress" "nazi" uniforms (like what Prince Harry got caught out wearing) are often a totally inaccurate pastiche of stuff. Whatever, if you choose to wear ANY world war two era German military uniform, then 95% of people would say that you are dressing as "A Nazi", wouldn't they? That said, its only fancy dress. I mean, people dress up as devils to go to parties, this does not mean that they are actual satanists. And many girls who dress up as "tarts" for fancy dress parties are not prostitutes in real life, either! Say what you like about the Nazis, Ed Balls was never a member. Too true, but people are being reared to be super-aware of things that don't matter a stuff, whilst child and animal cruelty reaches record levels. Life these days is fraightfully earnest and highly monitored. PCdom has reared its head and like so many politically contrived 'mechanisms', it is to society's detriment.